Mr. Destruct-o finally understands things. Like trick-or-treating (although at first he did the trick-or-treat thing and then ran into a strangers house to chase their dog) and Santa. He will also no doubt be more interested in decorating our tree when we put it up. Or as most young children do, decorate, undecorate, redecorate, destroy. See the dilemma? 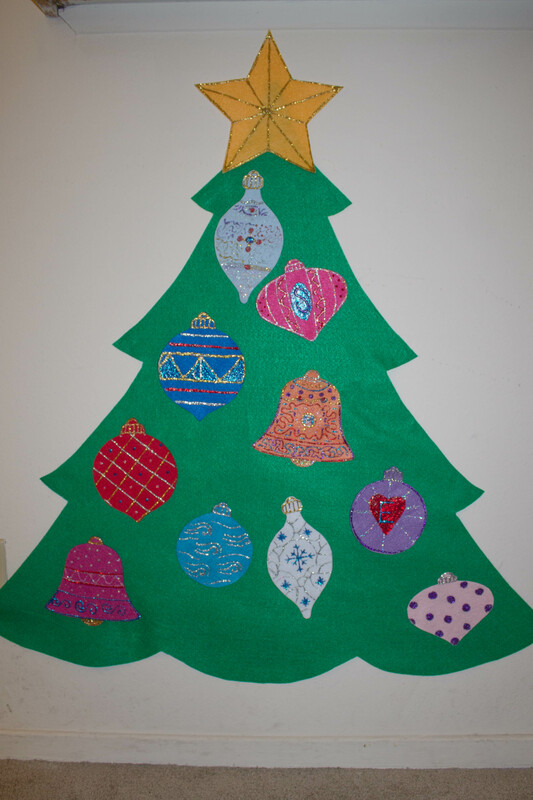 Enter my most brilliant friend, who asked me about making these felt trees that allow our young children to have control over their OWN tree. Absolutely brilliant! Also, it can’t be too hard, right? This project is great for gettin you girls together, and isn’t too expensive if you have paints on hand. This is also my first tutorial, so bear with me and please comment if you think I should add or change anything! 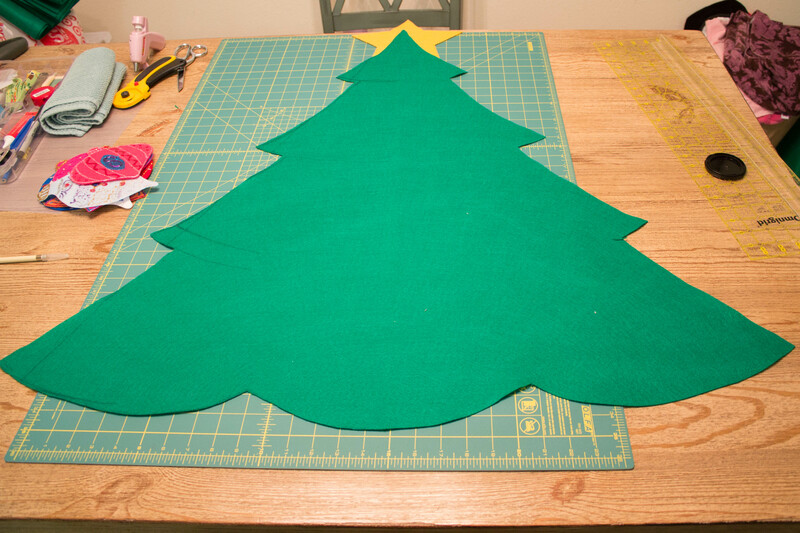 Fold your green felt in half length-wise, draw half a pine tree shape, using the fold as your center so your final product is symmetrical. Cut through both layers to get your tree. 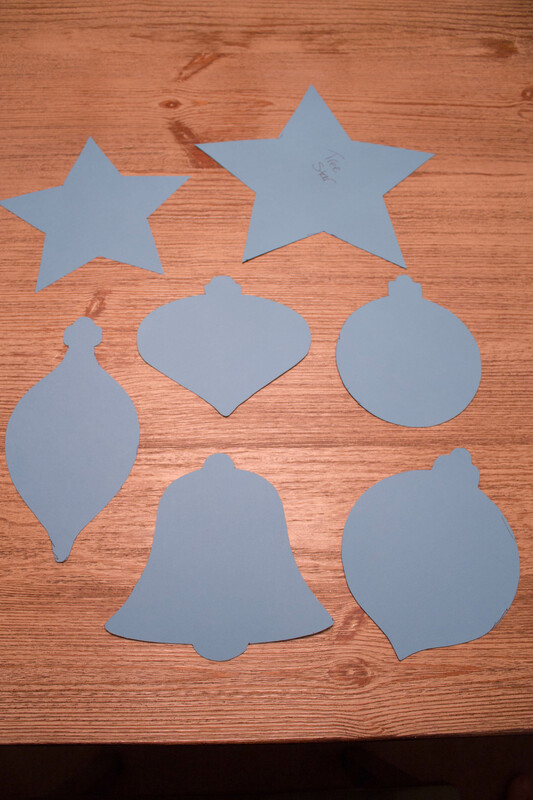 Print ornament templates onto card stock (or design your own) and cut them out. *Optional* Draw and cut your trunk, you may want to cut a felt sheet in half and just use that. Glue your trunk to the back of the tree and star to the top of the tree. Paint your star and your ornaments. Remember that felt sticks to felt, and you shouldn’t need additional adhesive. If you pile the paint on, the ornaments will get too heavy and fall off. If you want to be super decorative and find your ornaments fall off easily, you can always get some velcro strips and glue them to the ornaments to give them extra hold. Also, the scraps you have left make great decorations on your ornaments as well. 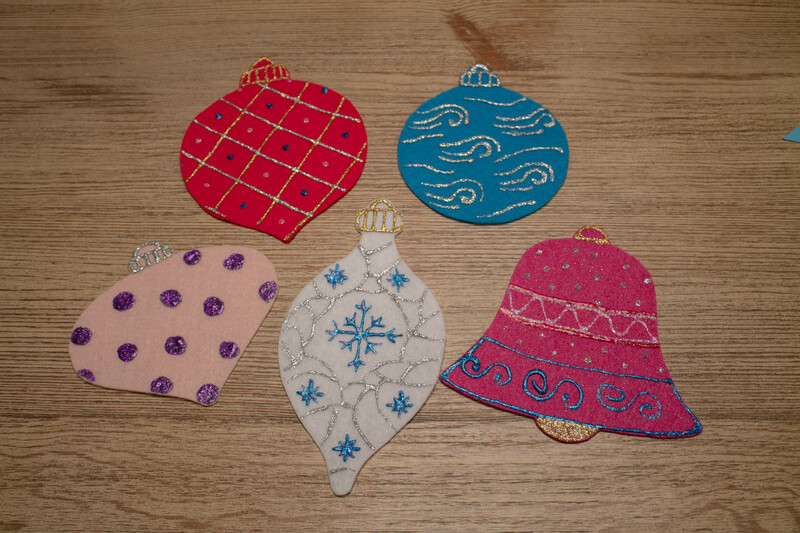 Stripes, polka dots, candy canes, initials, you could use scraps to make felt decorations to glue directly onto your ornaments. Place an adhesive strip on the tip of each tree “branch,” one on the star, and one at bottom center of your tree. When adhering it to the wall, start at the top with your star and work your way down to the bottom. I didn’t need to do any adhesive strips in the center of the tree, just along the edges worked just fine. 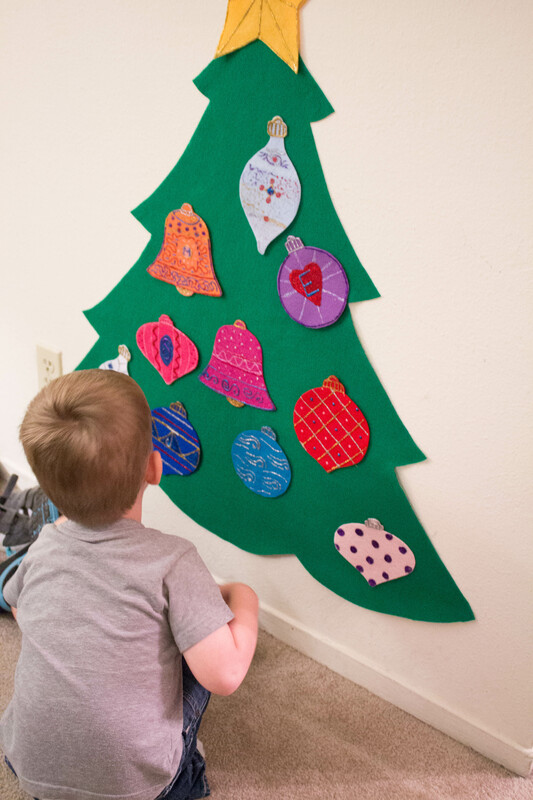 Once your ornaments are dry, let your kids put them on the tree! These are seriously adorable and not a whole lot of work. 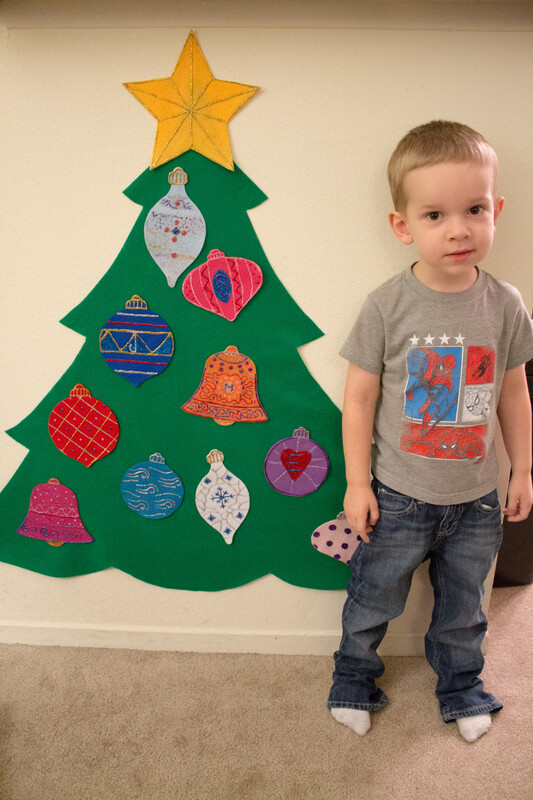 A super easy afternoon craft you can get your littles involved in! Hope you all had a happy holiday! Cute, fun and easy–love this! !